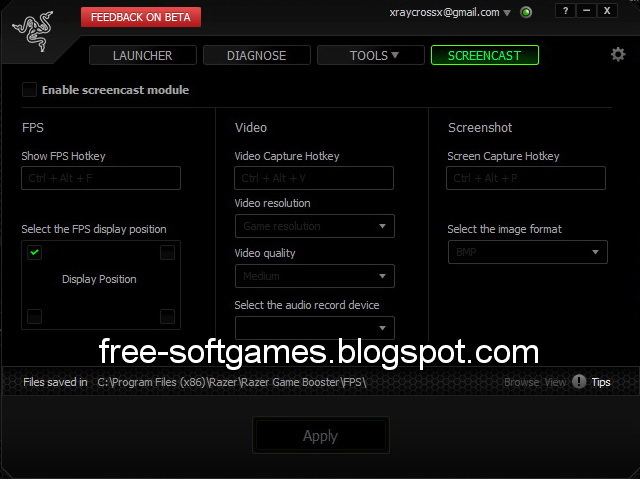 Free Download Razer Game Booster v3.5.6.22 - Ok, today I want to introduce you the brand new version of Game Booster which is FREE. So you don't need to pay anymore to get highest PC performance for playing all of your Favourite games. Razer Game Booster v3.5.6.22 is a really important utility that can boost and increase your gaming performance just with single click. So you don't need to worry if your PC goes Slow when you're playing High Quality Games, such as Call of Duty : Black Ops II, or Assassin Creed III. Getting the absolute best performance out of your system and games isn’t rocket science but it can sure be tough to figure out. In partnership with IObit, Razer Game Booster is your simple yet power solution. All it takes is a click of a button, and it will automatically enhance the state of your system and focus all its resources purely for gaming, allowing you to zone in on your game the way it’s supposed to be played without wasting time searching online for the best game settings or configurations. This feature focuses in on your game by temporarily shutting down unnecessary functions and applications, putting all your resources purely for gaming, allowing you to zone in on your game the way it’s supposed to be played without wasting time on settings or configurations. Pick your game, click on the "Launch" button and let us do the rest to reduce stress on your computer and improve frames per second. Don’t know where to start to optimize your computer and gaming settings? Remove all the confusion with the tweak tool, which will automatically analyze your PC and enhance all configurations for you. If you want to decrease the load time of your games, try using the defrag tool. Defrag will organize your game file folders and keep it organized to run more efficiently. The driver tool will keep your PC up-to-date. Click on “Drivers”, for a quick scan of your computer components and see what’s outdated and needs to be upgraded. Have you ever wanted to record video from your favorite game? Enjoy Share mode, a bonus feature where you can show off your skills, create tutorials, and more with the ability to record real-time audio/video and capture screenshots. Create Machinima and join the You Tube revolution! Set up the keys the way you want to show/hide your frames per second, record high-quality gameplay footage, and capture in-game screenshots. Now you can share your favorite gaming moments and scenes with all your buddies. 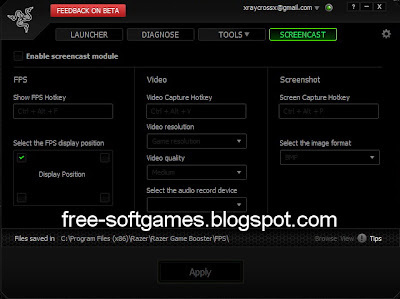 4 Respones to "Free Download Razer Game Booster v3.5.6.22 for Windows (20.15MB) - FreeRazerGameBoosterv3.5.6.22Win"
Thanks for giving information.It's very useful tips for beginners.From the past three months my favorite gaming performance affected by ping,I followed your blog and i used Game Booster v3.5.6.22.After that i checked my ping rate whether it's low or high using WhoisXY.com I got good results. Now my game running smoothly.